The stunning White Gold Diamond pendant boass a sophisticated look with a delicate snow flake design, suitable to match a variety of outfit styles and an ideal addition to any fine jewellery collection. Ideal to be worn every day or saved for special occasions, this beautiful 9ct White Gold Pendant is set with shimmering White Diamonds and elegant White Topaz center stones. This Steffans Pendant creates a fabulous statement piece and can be teamed up with similar style pieces from the Steffans Jewellery Collection to create a truly eye-catching look. Offering Products from RJC accredited suppliers. Committed to quality as well as design and customer services. 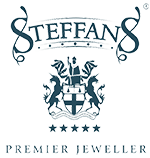 Steffans Jewellers has an enviable reputation for consistent excellence in customer service and innovation in product and brand development.